What are characteristics of rainforests? Tropical rainforests across the world are quite diverse, but share several defining characteristics including climate, precipitation, canopy structure, complex symbiotic relationships, and diversity of species. Every rainforest does not necessarily conform to these characteristics and most tropical rainforests do not have clear boundaries, but may blend with adjoining mangrove forest, moist forest, montane forest, or tropical deciduous forest. Tropical rainforests lie in the "tropics," between the Tropic of Capricorn and Tropic of Cancer. In this region sunlight strikes Earth at roughly a 90-degree angle resulting in intense solar energy (solar energy diminishes as you move farther north or south). This intensity is due to the consistent day length on the equator: 12 hours a day, 365 days per year (regions away from the equator have days of varying length). This consistent sunlight provides the essential energy necessary to power the forest via photosynthesis. Because of the ample solar energy, tropical rainforests are usually warm year round with temperatures from about 72-93F (22-34C), although forests at higher elevations, especially cloud forests, may be significantly cooler. The temperature may fluctuate during the year, but in some equatorial forests the average may vary as little as 0.5F (0.3C) throughout the year. Temperatures are generally moderated by cloud cover and high humidity. An important characteristic of rainforests is apparent in their name. Rainforests lie in the intertropical convergence zone where intense solar energy produces a convection zone of rising air that loses its moisture through frequent rainstorms. Rainforests are subject to heavy rainfall, at least 80 inches (2,000 mm), and in some areas over 430 inches (10,920 mm) of rain each year. In equatorial regions, rainfall may be year round without apparent "wet" or "dry" seasons, although many forests do have seasonal rains. Even in seasonal forests, the period between rains is usually not long enough for the leaf litter to dry out completely. During the parts of the year when less rain falls, the constant cloud cover is enough to keep the air moist and prevent plants from drying out. Some neotropical rainforests rarely go a month during the year without at least 6" of rain. The stable climate, with evenly spread rainfall and warmth, allows most rainforest trees to be evergreen—keeping their leaves all year and never dropping all their leaves in any one season. Forests further from the equator, like those of Thailand, Sri Lanka, and Central America, where rainy seasons are more pronounced, can only be considered "semi-evergreen" since some species of trees may shed all of their leaves at the beginning of the dry season. Annual rainfall is spread evenly enough to allow heavy growth of broad-leafed evergreen trees, or at least semi-evergreen trees. The moisture of the rainforest from rainfall, constant cloud cover, and transpiration (water loss through leaves), creates intense local humidity. Each canopy tree transpires some 200 gallons (760 liters) of water annually, translating to roughly 20,000 gallons (76,000 L) of water transpired into the atmosphere for every acre of canopy trees. Large rainforests (and their humidity) contribute to the formation of rain clouds, and generate as much as 75 percent of their own rain. The Amazon rainforest is responsible for creating as much as 50 percent of its own precipitation. Rainforests are characterized by a unique vegetative structure consisting of several vertical layers including the overstory, canopy, understory, shrub layer, and ground level. The canopy refers to the dense ceiling of leaves and tree branches formed by closely spaced forest trees. The upper canopy is 100-130 feet above the forest floor, penetrated by scattered emergent trees, 130 feet or higher, that make up the level known as the overstory. Below the canopy ceiling are multiple leaf and branch levels known collectively as the understory. The lowest part of the understory, 5-20 feet (1.5-6 meters) above the floor, is known as the shrub layer, made up of shrubby plants and tree saplings. 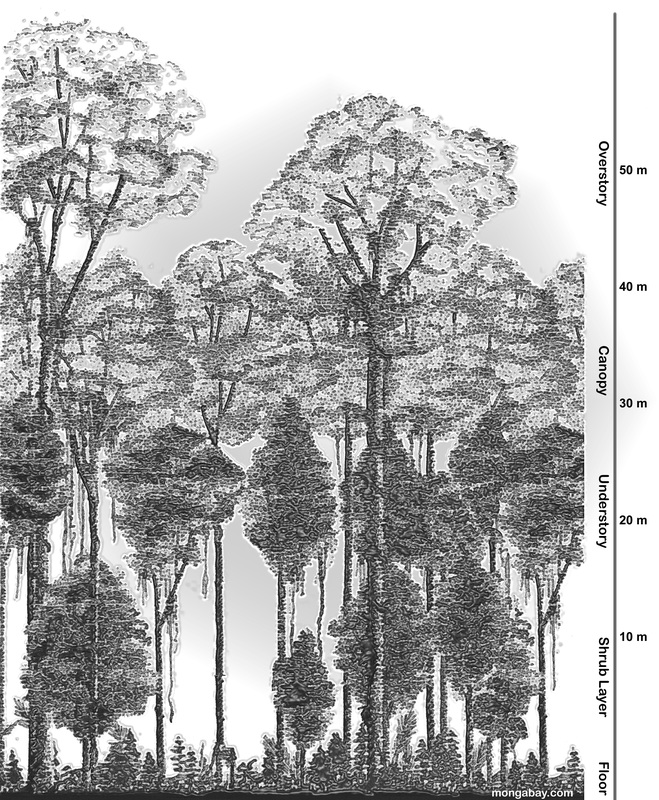 The heavy vegetation of the canopy effectively screens light from the forest floor, and in a true (primary) equatorial rainforest, there is little "jungle-like" ground growth to impede movement. Ground vegetation in primary forest is minimal and usually consists mainly of lianas (vines) and tree seedlings. An important characteristic of the canopy system is the presence of plants known as epiphytes, that grow on canopy trees. Epiphytes are not parasitic because they draw no nutrients away from the host, but use the host tree only for support. High in the canopy, epiphytes are better able to access the strong tropical sunlight, which they require for growth. Epiphytes have adapted well to their aerial environment, developing various means to collect nutrients from their surroundings, the mechanisms for which are discussed in detail in the canopy section. An additional plant type characteristic of the canopy system is the liana—a sort of woody vine that begins life as a shrub on the forest floor and makes its way up to the canopy by latching on to canopy trees. A related plant type, the hemiepiphyte, begins life in the canopy and grows long roots that eventually reach the forest floor. Once rooted, hemiepiphytes do not have to rely on capturing nutrients from their canopy surroundings, but can access nutrients from the forest floor. Unknown numbers of plants and animals reside in the canopy, the vast majority of which are specifically adapted to life in this leafy world. In tropical rainforests, it is estimated that most of the species that exist in the ecosystem reside in the canopy. Since the tropical rainforests are estimated to hold 50 percent of the planet's terrestrial species, the canopy of rainforests worldwide a substantial proportion of life on Earth. Interdependence—whereby all species are to some extent be dependent on one another— is a key characteristic of the rainforest ecosystem. Biological interdependency takes many forms in the forest, from species relying on other species for pollination and seed dispersal to predator-prey relationships to symbiotic relationships. These interdependent relationships have been developing for millions of years and form the basis for the ecosystem. Each species that disappears from the ecosystem may weaken the survival chances of another, while the loss of a keystone species—an organism that links many other species together, much like the keystone of an arch—could cause a significant disruption in the functioning of the entire system. For example, Brazil nut trees (Bertholletia excelsa) are dependent on several animal species for their survival. These large canopy trees found in the Amazon rainforest rely on the agouti, a ground-dwelling rodent, for a key part of their life cycle. The agouti is the only animal with teeth strong enough to open their grapefruit-sized seed pods. While the agouti eats some of the Brazil nut's seeds, it also scatters the seeds across the forest by burying caches far away from the parent tree. These seeds then germinate and form the next generation of trees. For pollination, Brazil nut trees are dependent on Euglossine orchid bees. Without these large-bodied bees, Brazil nut reproduction is not possible. For this reason, there has been little success growing Brazil nut trees in plantations—they only appear to grow in primary rainforest. Life in the rainforests is competitive and countless species have developed complex symbiotic relationships with other species in order to survive. A symbiotic relationship is a relationship where both participant species benefit mutually. Symbiotic relationships appear to be the rule and not the exception in the rainforest. For example, ants have symbiotic relationships with countless rainforest species including plants, fungi, and other insects. One symbiotic relationship exists between ants and caterpillars. Certain caterpillar species produce sweet chemicals from "dew patches" on their backs, upon which a certain ant species will feed. In return, the ants vigorously protect the caterpillar and have even been observed carrying the caterpillar to the nest at night for safety. This relationship appears to be species specific in that only one caterpillar species will cater to a particular ant species. All tropical rainforests are characterized by tremendous biological diversity. Section 3 concentrates on the diversity of the tropical rainforest. Where/how does the rainforest get its energy? Rainforest are _________ since they are warm and have a lot of moisture in the air. How much rain do rainforests get? How do rainforests create their own rain? What are two things affecting the water cycle of tropical rainforests? Drought makes rainforests susceptible to what? The opening quotation is found in One River (New York: Touchstone, 1996) by Wade Davis. Timme, S. ("Neotropical Plants and Ecology," Rainforest Workshop Packet 1994) pegs transpiration of individual canopy trees at 200 gallons of water per year - translating to 20,000 gallons transpired per acre of forest. Newman, A. in Tropical Rainforest, a world survey of our most valuable and endangered habitat with a blue print for its survival (New York: Facts on File, 1990) notes that large rainforests create as much as 75% of their own rain. The Woods Hole Research Center concluded in its RisQue98 (Risco de Queimada, or "Risk of Burning" in Amazonia - 1998) that as much as 50% of the Amazon rainforest was at risk of burning. The report was picked up by the popular media in Lewan, Todd. "Fears of a fiery Amazon nightmare-7-year study has implications for the global warming debate," Associated Press, 12/7/97. Two-thirds of the world's rainforests are fragmented according to M. McKloskey in "Note on the Fragmentation of Primary Rainforest," Ambio 22 (4), June: 250-51 1993. Paine, R. T. ("Food web complexity and species diversity" American Naturalist 100: 65-75, 1966) put forth the notion of a keystone species. Further discussion of the term can be found in Power, M. E., et al., "Challenges in the quest for keystones," BioScience 46: 609-620, 1996; and Khanina, L., "Determining keystone species," Conservation Ecology 2(2), 1998.